Each year, OSU Campus Recycling and Surplus Property, in collaboration with University Housing and Dining, coordinate an effort to reduce waste during residence hall move-out by educating residents and giving them the tools to recycle and donate as much as possible. In 2018 we also partnered with Corvallis Community Relations to host an off-campus donation drive for students not living in residence halls. OSU has generally been increasing the weight of donations since 2010. 2018 saw a high level of donations at 32, 313 pounds which exceeded our 30, 000 pound goal! Most of the donation increase came from clothing and housewares, with housewares totaling over 14,000 pounds. 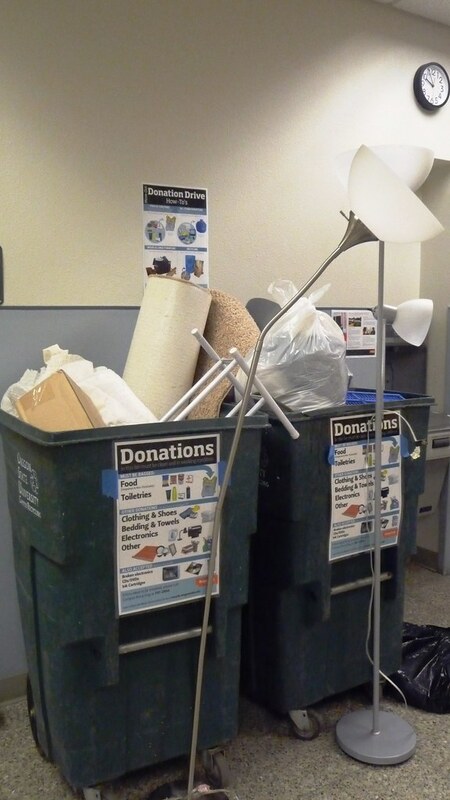 The donations help our local nonprofits and those in our community who are in need, plus it benefits the environment by promoting the reuse of materials! Residence halls receive move-out kits, which students can pick up from the front desk. These kits include bags in which to sort the materials in their room. Plastic bags are provided for food, toiletries, clothing, bedding, and small housewares. Labeled donation bins are located in the lobby, along with all the recycling receptacles. Residents are made aware of the upcoming donation drive starting about one month in advance. Info is provided via abundant signage inside the halls, large posters at each UHDS service center, notices in the Campus Living eNewsletter, a presentation to the Residence Hall Association General Assembly, posts on social media (Facebook, Twitter, and Ecologue blog), and a web page made just for residents.